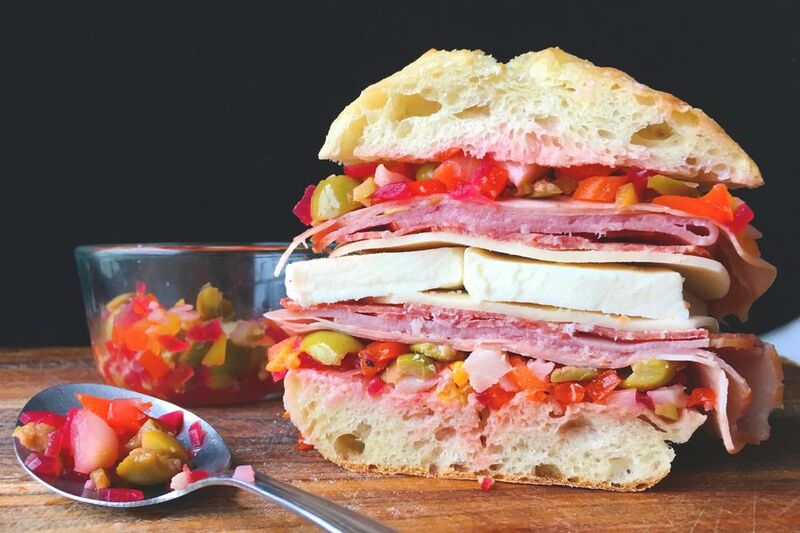 If you've ever visited New Orleans, you're sure to have tried an authentic muffuletta. And if you haven't been in NOLA, that doesn't have to stop you from having one of the best sandwiches in the country. Stacked high and pressed flat, this sesame seed bun sandwich features layers upon layers of beautiful mortadella, ham, salami, provolone and fresh mozzarella. The famous olive spread is full of briny goodness and makes this sandwich even more flavorful. Roughly chop the pimento stuffed green olives, the giardinara, the banana peppers, and the quick pickled red onions. Then add them to a small bowl. Toss with the quick pickling liquid and the olive oil. Set aside. op with half the mortadella, half the ham, half the salami, half the provolone and all the mozzarella. Then add the remaining provolone, the remaining salami, the remaining ham, and the remaining mortadella. Top the meat with the remaining spread and put the top piece of bread on top. Wrap the sandwich tightly in tinfoil and put something heavy on top of it for at least 30 minutes before serving so that the flavors can meld and the sandwich stays together better.